The Senior Minister, Hon. 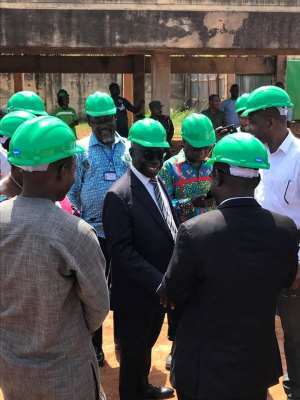 Yaw Osafo-Marfo has paid a working visit at the University of Ghana Stadium to know the progress of work. The Technical Advisor at the Ministry of Youth and Sports, Dr Emmanuel Owusu Ansah who represented the Minister of Youth & Sports was present as well as Professor Ebenezer Oduro Owusu, Vice-Chancellor (UG). As Ghana prepares to host the 2023 All African Games, it is important that the nation presents the most modern sports facilities and equipment for the Games. Even before the All African Games, Ghana must prepare and take part in the 2019 Games to be held in Morocco and the 2020 Olympic Games in Tokyo, Japan. Already, the government of Ghana, through the Ministry of Youth & Sports is putting up mini stadia all over the country, and the president Nana Akuffo Addo must be commended. For the All African Games, the nation will host a number of sports disciplines and the venues or centres marked for the Games must provide all the facilities and equipment. With the Accra Sports Stadium now well fitted, Kumasi, Tamale, Essipong and Cape Coast would also be renovated and Ghana is on the go. Yours Truly would love to appeal to the Ministry of Youth & Sports to upgrade the tartan tracks at the El Wak Military Sports Stadium and put up one sports complex in the South West of Accra where there are many budding sports talents.